Covers installing Windows 7 to VHD, installing and configuring Grub4Dos, installing FiRaDisk driver. Finally, describes loading VHD image into RAM and booting it. Edited by far.in.out, 18 April 2013 - 09:33 PM. I've only skimmed through it at the moment so please excuse me if this was covered (and missed by me) but does it include any tips on reducing the Windows installation size. I have 4GB RAM on my desktop - any tips on shrinking Windows 7 to meet these RAM restrictions. Just out of curiosity, how small was your WIndows 7 installation? Also used Windows Embedded Standard 7 SP 1, installed minimum configuration system - size was under 1 GB. Win Embedded 7 is a very interesting thing for running from RAM. Hadn't the time to play more with it but looks very promising so far. Check it out. Your rt7lite presets download for x64_001.inf contains the x86_001.inf. OK -it is working now - needed to repair the download - dunno what happened there. Edited by SIW2, 20 July 2012 - 01:53 PM. Those presets are extreme removal, you need something else for everyday use. I'll upload some more presets later. Also, for x64 version you need to enable testsigning before installing FiraDisk driver, refer to html documentation for details. Should this not also be abel for win XP its mutch smaller i think! It is a very interesting subject! You are starting grub4DOS from bootmgr, grub shows up to provide ~5GB RAM. What would be provided when You install grub on blank disk? Also 5GB? Or is it dependend on what Win7x64 can deal with? But isn´t 32bit OS limited to use 3,25GB? It would also be interesting to know if the VHD-boot option, especially VHD-booting by grub, is limited to Enterprise and Ultimate. Edited by ReTokener, 21 February 2013 - 09:01 PM. Hi. VHD boot is available on Ultimate, Professional and Enterprise editions (also Server 2008 R2 ofc). This is from hdd, native Windows VHD workflow. Grub4Dos always shows the amount of accessible RAM, has nothing to do with where it is run from, blank disk or flash disk or cd rom or whatever. You can tell Grub to only use RAM above some point in memory address space, so you can have all the accessible RAM left to Windows and the rest used for RamDisk. 2. After booting in WES7 the system show that it installed RAM disk, and asks if I would like to restart system now, or later. Is there any solution to remove this pop-up window? Maybe to attach a grub4dos ram disk while native boot from VHD, so that WES7 could store information about new device, or anyhow disable this question in system? 1. You can't install all described in this tutorial stuff without ANY physical HDD in system. Windows will not install itself in VHD file located on Flash drive, if the Flash drive is the only drive in the system. Hey Robbin2, glad to see ru-board'ers here. Yes you can mount a small Ramdisk while booting from HDD and let system install that hardware, afterwards it shouldn't ask any questions. Maybe, just maybe, this is connected with the way Windows sees the VHD and the Flashdrive, and cannot decide where to store the pagefile and/or something of the like prevents the install. VHD boot, no problem for XP with installed Firadisk driver. HDTune states: Transfer Rate: Average 1400MB/sec. It's a problem with your BIOS. It has a bad USB driver. You can try using Plop. Maybe it helps. Could you please explain how it could be done? Use ImDisk? Won't it use its own drivers, instead of Firadisk? I believe its because of Widnows' inablity to work with 2 partitions on Flash drive. Maybe if I have Windows installed on Flash Drive, and try to install another window on this drive but in VHD it stops because of this limitation. Windows Embedded Standard 7 with my template does not create pagefile by default at all. Im using SuperMicro SuperServer 7046GT-TRF, and I'm pretty sure it is not because of BIOS. Meanwhile, could you please provide a link on "how to" or some config for plop to upload VHD in RAM disk and boot it? it means that i used another topic to help me build the win7-vhd . to install the win7 x64 , i found that best size for the vhd is above 12 Go and i have set it at 16 Go . 16 Go being also the amount of ram of the mainboard . 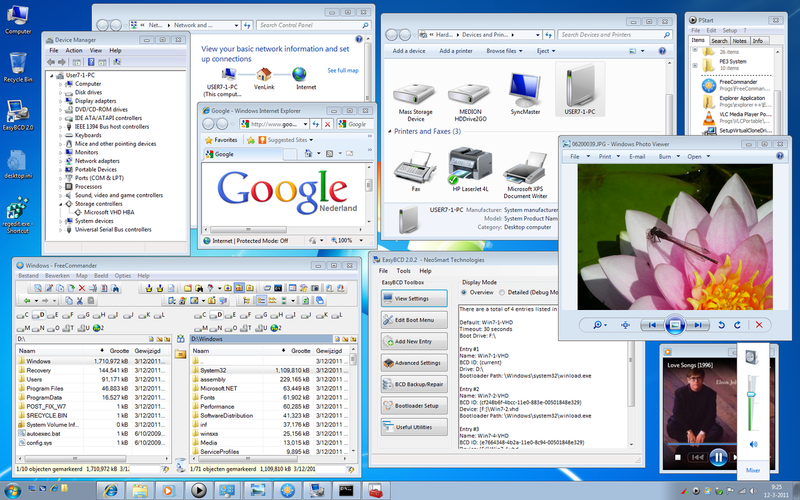 i used easeus and win7 to reduce the size of the vhd . first i compressed the ntfs partition , then shrinked and made a copy of it in a new file below the 12Go . i skipped the "Adding bootmgr and shrinking the VHD"
and did all the "Installing FiraDisk"
during first boot windows was returning to the prompt until i used the boot with not signed driver : firadisk . i will change that in my vhd , may be that is a missing step of your doc ? Meanwhile I tried different server (Dell Precision 7600) and different flash drive too, the speed is the same, 8MB/s seems to be a limit of GRUB4DOS. By the way, is there any way to load a .VHD from network to RAM? Maybe through iSCSI or AoE? But as i know RAM disks only work with GRUB4DOS, and GRUB4DOS does not work with iSCSI or AoE, any alternatives? Just TRY the given driver and report. I've managed to get this to work using the video at the top of the post, however, GRUB4DOS only sees about 4.5GB of my 8GB RAM, meaning only a very lite W7 install will work. I understand that this is because G4D needs contiguous memory, I currently have 2x 4gb Sticks in my machine and I was thinking of buying a single 8GB stick to try and get G4D to see more of it. Does anyone know if this will work before I spend the money on an 8GB RAM stick? Has anyone managed to get G4D to see a substantial amount of RAM, 6GB+, 8GB? When I did get the lite W7 to work, and did a speed check, the results where amazing..... Access Time 0.2 MS, sequential and random read of about 4GB/Sec. I just didn't like the lite version of W7. Brilliant. Thanks for the reply . I have ordered another 8GB, so looking forward to the results. Then I think I'll increase it to the full 32GB that the M'board can take.